Earlier this week, I felt as if I reached a crossroad. As if I had to make a decision between this blog and The Boy. I questioned the purpose of writing it at all. Why must I choose? When what I really need to do is choose wisely. Oops...sort of forgot about that one. Who knew I would find inspiration on the Uptown 6? Anyway, it made me remember the reason why I started this blog. I wanted to tell a story. I wanted to inspire others just as The Boy inspired me. To raise awareness. To inform and to educate. And the reason I wanted to do this was because when it comes to mainstream media and autism - Latinos are so rarely featured. Because our stories are not on the bookshelves. 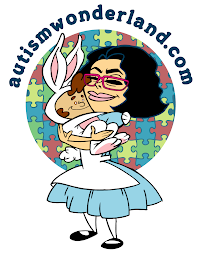 I started this blog because I wanted to erase the stigma of autism within the Latino community. The purpose of this blog is The Boy. He is my great success story. And I'm going to continue it.